In the Korean Jamo page we saw the various romanisations used to transcribe Korean in a western transcription. This page will be concerned with some of the thoughts behind the Hangeul alphabet. The Korean Language Society (KLS) romanisation will be used here, although for popularly seen terms and names, we shall provide them in brackets. 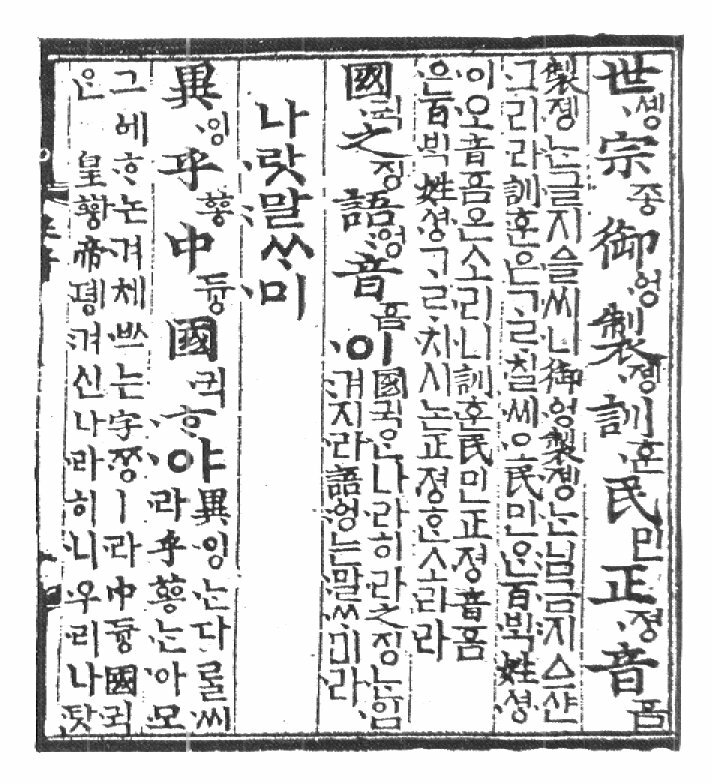 The Korean script was invented during the reign of King Sejong á¦ðó (r. 1418-50, fourth ruler) of the old Korean kingdom of Joseon (Chosôn) ðÈàØ in 1443. It was called Hun Min Jeong-Eum (Hun Min Chông Ûm) ýºÚÅïáëå "proper sounds to instruct the people". It was later promulgated in 1446 as method for the Korean peoples to write Korean without the use of Hanja ùÓí® or Chinese characters, and also a means to fix the pronunciation of Hanja. Below is an extract from Hun Min Jeong-Eum. The characters found here are the precursors to modern Korean hangeul, and they are outside the scope of this page. Korean linguists devised a method of splitting the syllable into three parts, the initial, medial and ending. In the Hun Min Jeong-Eum, the articulation of the initials provided the basis for the shape of the consonant jamo í®Ù½. The vowels come from a philosophical basis dependent of the concepts of Heaven, Earth and Man. Today, a set of 40 basic characters are used. 19 of these are used as initial consonants and also consonant endings). They consist of 14 single consonants five double consonants. There are 21 vowel-like characters which consist of 10 vowel bases and they are brought together in combination to make the remaining 11 vowels combinations. These 40 basic jamo characters are used to compose an alphabetic writing known as Hangeul ( É¯ ±Û / É¯ ±Û ). Velars : depicting the root of the tongue blocking the throat at the back of the mouth. These follow the single consonants, when listed under Korean Hangeul order. There are ten basic vowels in Korean. They are composed originally from three vowel types, Heaven (¨ý a ), Earth (¨Ñ eu ) and Man (¨Ó i ). The dot and vertical may be doubled to form other characters. The basic characters or jamo í®Ù½ are not like letters of the western alphabet which come sequentially after each other. The jamo themselves are arranged for each syllable so that they fit into an imaginary square. We can see this in the title of this page, the syllables for Han Geul ( É¯ ±Û / É¯ ±Û ). But first, we must provide information for the case when a syllable does not begin with a consonant, that is a syllable that starts with either a vowel, or w and y. This is sometimes called a zero-initial syllable. In the list of consonants we notice that for the Korean letter ¤· / ¨· , there are two corresponding values, *-, -ng. It is this character which is used in combination with the vowels to form a zero initial syllable. The second sound value of this character occurs only when it forms the ending of the syllable, hence the positioning of the hyphen which shows for *- something follows, and for -ng something precedes it. We note here that the vowels cannot exist meaningfully without the character ¤· / ¨· by it. This character is situated to the left (¾Æ "a") or on top (¿À "o" ) of the vowel character where a zero inital syllable is used.